The brand new BMW 5-Series is everything you would expect from the Bavarian car maker. Take the 550i and you will experience a combination of power, handling, comfort, luxury plus tons of technological highlights you won’t come across in many other luxury saloon packages. 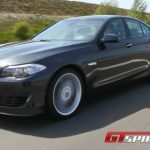 The 2011 BMW F10 5-Series – often referred to as the baby 7-Series – is the sixth generation of the vehicle and it is here to stay for the next few years. Alpina have taken the brand new top of the line model and created a package which fits between the stock 550i and the upcoming F10M M5. The exclusive tuner with manufacturing status from Buchloe, Germany injects a little extra passion to cars that already come from the factory as decent and fast luxury cars. Alpina’s latest creation is named the B5 BiTurbo, giving away the essence of the upgrades. Subsequently, the looks have changed, leaving us with only single question; how does it drive! 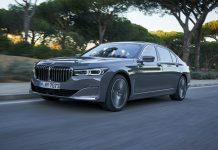 The package, offered to us for a multi-day test drive, is based on a long-established benchmark mid-size sport sedan packed with every single BMW option you could imagine, sharing its platform with the current 7 Series. Built in Dingolfing, Germany, the architecture is shared through many common visible and non-visible components. 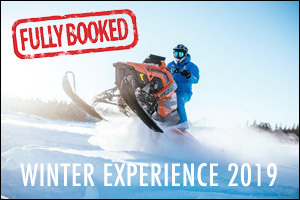 Our first impression was that it has changed its initial characteristics from sport to luxury and it has moved up market significantly. 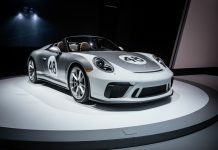 The standard power-train setup includes a direct-injected 4.4 liter twin-turbo “N63” V8 punching out 407 horsepower and a stump-pulling 600 Newton-meter of torque between 1,750 and 4,500rpm, while peak horsepower appears between 5,500 and 6,400rpm. Our test car arrived fitted with the automaker’s new super high-tech, buttery-smooth and lightning fast eight-speed automatic (ZF 8HP70). Stock performance figures? 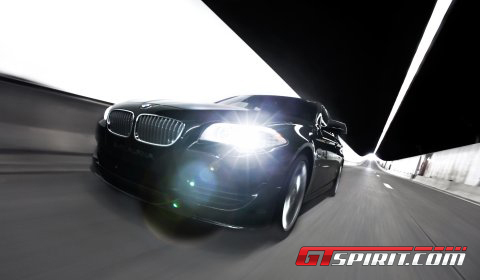 The 550i in its standard form has a maximum speed of 250km/h and 0-100km/h in five seconds. 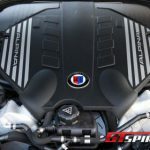 Generating 507hp at a modest 5,500rpm, and with maximum torque of 700Nm available from 3,000 to 4,750rpm, the V8 power-plant inside the Alpina B5 BiTurbo provides more than enough additional performance, pace and acceleration. Upgrades have been realized by swapping the stock twin-turbo for two Honeywell-Garrett turbochargers, which sit inside the V of the two cylinder banks, working in parallel to force-feed the aluminum engine. 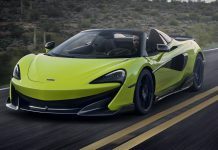 Compared to its super-charged predecessor, this engine configuration delivers more torque over a broader range and improves throttle response at lower revs. 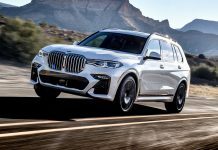 This is achieved merely because of the basic setup of the 550i, being more sophisticated it provided a leap forward for possible engine enhancements. Additionally, an optimized indirect inter-cooling system with a short intake and a stainless steel exhaust system featuring two double-ended, polished tailpipes are outfitted to the luxury sedan. Adapted and tested in cooperation with ZF, the advanced eight-speed sport automatic transmission gets its own upgrades. Switch-tronic buttons were added to the steering wheel, providing an option to shift manually at the touch of a button without removing your hands from the steering wheel. With the upgrades installed the gear changes remain immensely smooth, fast and the throttle response adequate. Throttle lag is negligible, and power stays strong and seamless. In Sport Mode a completely different character emerges, gear changes are virtually immediate. The innovative single-cylinder fade-out facilitates super quick up-shifts in just milliseconds, accompanying each up-shift with an addictive, deep back-pressure burble from the Alpina exhaust. The system also allows for multi-simultaneous down-shifts in fractions of a second, hereby the transmission will skip several gears depending on accelerator loads and engine revs. Moderate driving in Sport mode creates a sleeping beast, ready to attack if needed. The gearbox automatically shifts upwards when a cruising speed is established, saving fuel and leaving the driver with the thought the S-mode had been disengaged automatically. Pushing the throttle reminds the driver that an additionally setting was chosen creating an undefined increase of oomph with respect to the stock setup. The performance figures confirm this feeling. 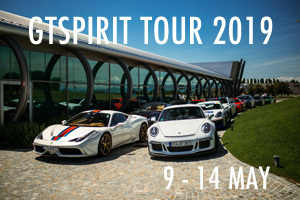 Sprints from standstill to 100km/h are done in just 4.7 seconds, top speed is reached at 307km/h. 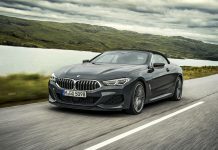 Accompanied by a distinctive V8 noise, any driver familiar with the stock exhaust and setup of the 550i would immediately experience the improvements made to the power-train characteristics. 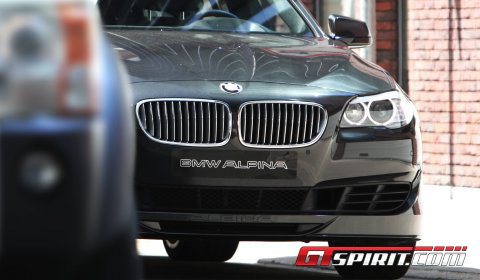 Alpina left its mark here on performance and exhaust tune! Even though BMW has broken with the past and its reliance on a strut and shock system in favor of a new multi-link system for both front and rear chassis geometry, Alpina decided to take additional exit and outfit the 5-Series with shorter but very progressive springs and special suspension arms, which in combination results in more camber for the front track. Together with the light-weight 20 inch Alpina Classic rim and tyres the modifications have created a very balanced and direct chassis set-up, with precise turn-in. The steering is linear, but a bit dull and lacks ultimate tactility leaving room for improvement when it comes to sportiveness. The non run-flat tyres 255/35ZR20 at the front and 285/30ZR20 at the rear. They establish part of the improved handling, which offers adequate comfort for everyday usability or razor-sharp handling when called for. Using the Drive Dynamic Control button, the driver can select between Normal, Comfort, Sport and Sport+. This system has been calibrated by the German tuner and is tied into other system parameters controlling power steering, torque cushioning and dynamic stability controls. The differences between settings is easily noticeable and provides a decent amount of room for personal choice. Comfort is extremely soft, Sport+ tackles a tinny bit of the sportiveness the stock 550i lacks. A thought left in our mind after the road test was the fact that the handling and steering isn’t up to the league of M Power. Surely not a downfall, because the basic setup provides a moderate level of sportiveness, but focuses on delivering a decent amount of comfort. The ride quality is firm and smooth, but we can’t wait for the next M5 that’ll be based on this chassis architecture. The exterior design includes a new front, which commands attention with more aggressive, aerodynamic lines and wider openings. The B5 BiTurbo carries two double-ended tailpipes neatly integrated into the rear valance, a discreet rear diffuser completing the silhouette. 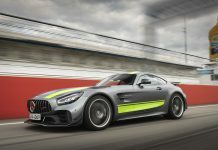 In combination with the rear spoiler, all aerodynamic components interplay to yield a reduction in lift of up to 60 percent at the front and 30 percent at the rear, according to the German specialist. The interior is a higher-quality cabin supporting a wonderfully smooth and fast journey. The test vehicle was equipped with every possible highlight on the option list. From infrared night vision and lane-assist, to blind lane exit side-view cameras, to lane departure warning cameras, rear sunshades, heated front seats, iPod and USB adapter – this car has it all. It will even parallel park itself. The razor-sharp 10.2 inch 1280 x 480 pixel “transreflective” display, meaning light from the sun actually enhances the images on the screen, offers you entrance into the world of iDrive. The system provides a navigation system with 3D landmarks, tutorial videos, voice control and access to the side-view cameras which help entering parking spaces. A driver-oriented dashboard follows BMW’s standard approach to ergonomics and makes the driver feel in command using the head-up display as a tool to keep the eyes focussed on the road. The front seats offer good side support and thigh extensions to make longer trips even more comfortable. The rear seats are adjustable too, but this will mean that longer people will lack a bit of leg space. The test car had a rear-seat audio and video entertainment system installed. 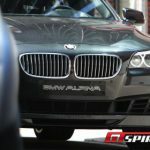 Alpina added its own subtle decals to the stock package. The classic Alpina luxury Myrtle wood is not our personal choice, but is found only on the USA’s Pacific Coast where it is cultivated from dedicated Laurel tree groves. A special name plate just underneath the sunroof confirms the B5’s origin. 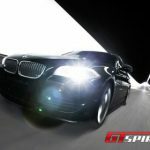 The BMW 550i has become a combination of sportiveness second and luxury first. 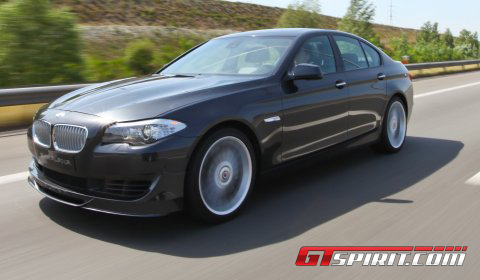 The Alpina B5 BiTurbo adds a bit of flavor to it, creating a 50/50 between the two. In both cases it is an impressive machine and a pleasure to drive. It has plenty of performance in every parameter, creating a model which fits perfectly between the upcoming F10M M5 and the stock 550i. 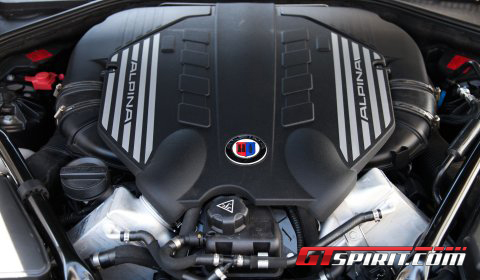 The refinements offered by Alpina were not all on our “must-have” list. We would for instance opt for the performance upgrade at an instance, but leave the Switch-tronic buttons out of the order form and choose for the Sport Automatic upgrade with paddle shifters. Same goes for the Alpina luxury Myrtle wood used inside. 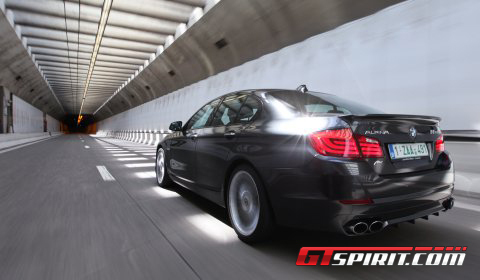 The Alpina B5 BiTurbo offers what states a fine balanced mix of driving dynamics, comfort and everyday luxury. Additionally, an Alpina B5 Bi-Turbo Touring is available at this moment, making it the quickest of its kind up to the moment a F10 M5 Touring is offered. A perfect companion for any day business commuting and dynamic leisure if requested. Thanks to the Belgian Alpina importer, Jean-Michel Martin, giving us the chance to drive this Alpina sports car.